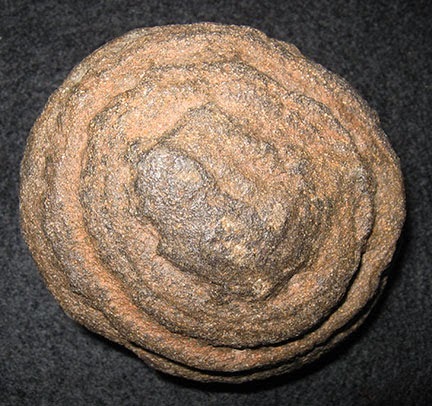 concretion = hard, compact, rounded mass of mineral matter and silt or sand grains. 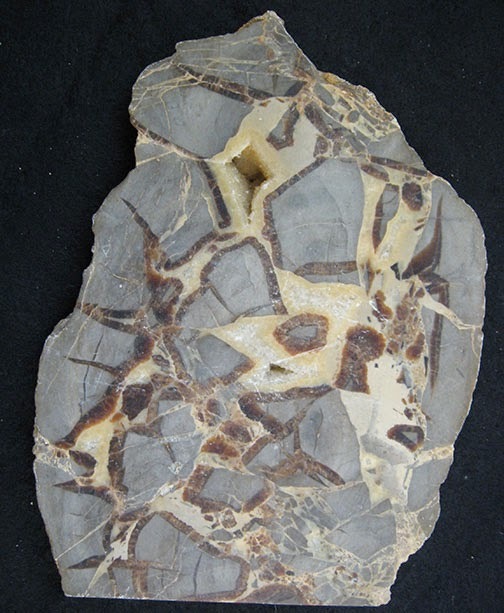 The concretion generally forms by localized precipitation from aqueous solutions commonly around a nucleus consisting of some debris, including organic matter (like a leaf, shell, or bone, etc.) in the pores of a sedimentary or fragmental volcanic rock. The concretion weathers out differently than the surrounding rock because the concretion is commonly more tightly cemented. 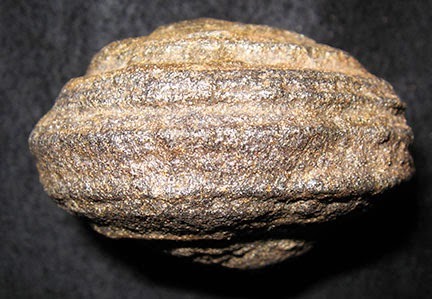 Although it is possible that a concretion might have a fossil at its center, there is no easy way to determine this unless you crack open the concretion. dendrites = a chemical stain consisting of an oxide of manganese that crystallized in a branching pattern resembling that of certain plants. 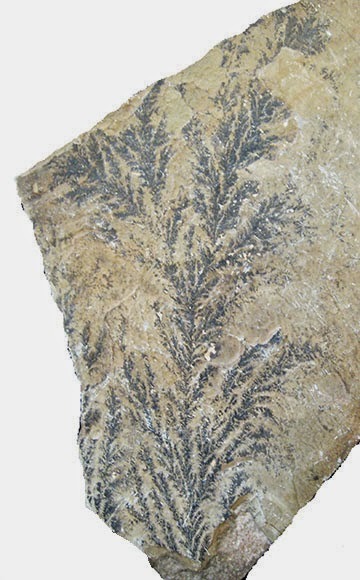 Upon close scrutiny, one will see that the dendrites pattern is not seamlessly connected (i.e., unlike plants). cone-in-cone structure = occur in thin calcareous (limy) layers of some mudstones; the structure resembles a set of concentric circular cones fitting one into another in inverted positions (base upward, apex downward) and commonly separated by clay films. The formation of these structures is apparently because of pressure along conical shear zones in carbonate rocks. septarian nodule = roughly spheroidal body, commonly of impure carbonates, with a radiating series of crystal-lined cracks that intersect and form irregular polyhedral blocks with the body. 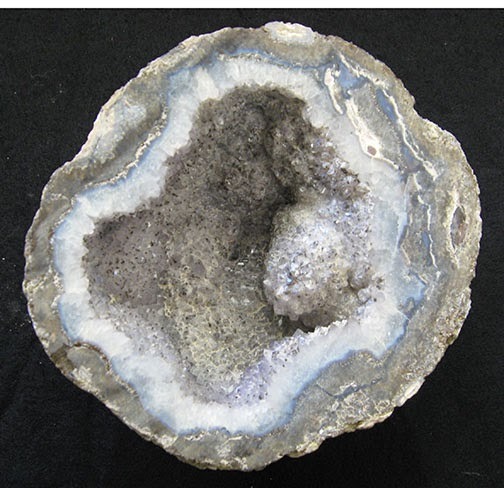 geode = hollow to partly hollow, or in some cases a filled, subspherical body lined with crystals. The crystals are commonly quartz. Geodes are present in volcanic and certain sedimentary rocks. Labels: concretion, cone-in-cone structure, dendrites, geode, septarian nodule. 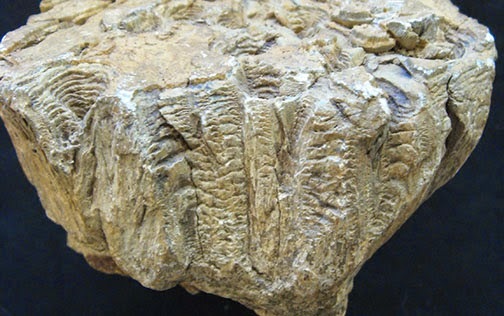 Pseudofossils are beautiful, I particularly like the Dendrites.